These outdoor message centers have sliding glass doors and the cabinets are made from recycled plastics. It just wouldn't make sense to put a non-green product on a nature trail would it? 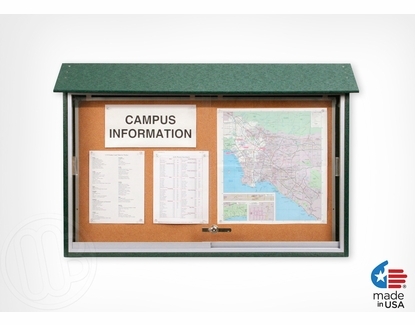 These American made outdoor message units can be wall mounted or use the optional lawn mounting post kit which is sold separately. are solid all weather cabinets that won't split, peel, crack, or rot out when faced with the elements. Totally maintenance free! Tired of repairing and painting your existing units then this is exactly the kind of all weather resistant outdoor message center you need. 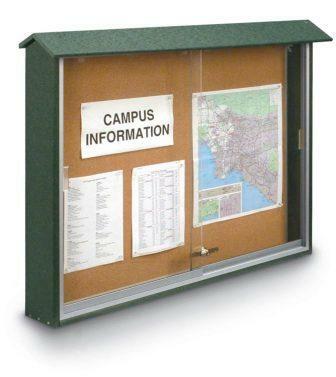 Constructed with a high density polyethylene, these message centers provide you a safe, weather resistant place to post important information, trail maps and more while the recycled construction materials are impervious to moisture, chemicals and insects. 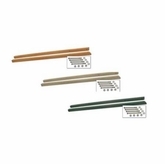 The sliding glass doors move back and forth with minimal effort on nylon rollers and they're secured with a heavy duty ratchet locking system which is included with every unit. 45" Wide x 30" Tall - 65 lbs. 45" Wide x 36" Tall - 80 lbs. 52" Wide x 40" Tall - 99 lbs. The heavy-duty construction will provide for years of use. 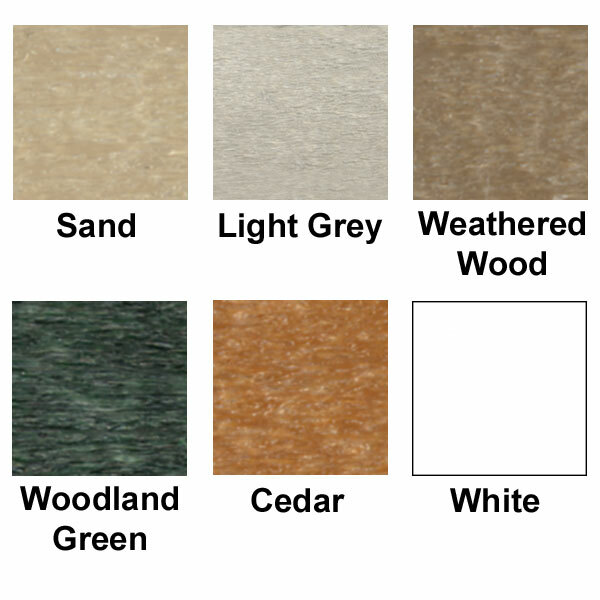 Recycled plastic lumber stands up to water, insects and chemicals. Made with maintenance free material. They will not crack, rot, decay, split or chip. Fully finished back not only looks great on posts but it also adds structural integrity. The tack surface is a natural cork tack surface. There is a ratchet type lock with 2 keys included with each unit. If the interior surface wears out over time it is completely removable for easy replacement. Glass Material: 1/4" thick acrylic. 1 1/2" wide door frame. 5 1/2" exterior depth, 3 3/4" interior depth. 8 1/2" rain cover depth. 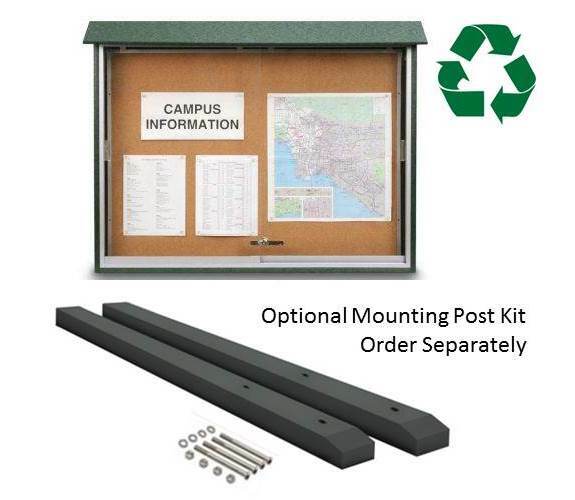 Optional lawn mounting post for models UV-MC, UV-SDT and UV-DD outdoor enclosed message center units.